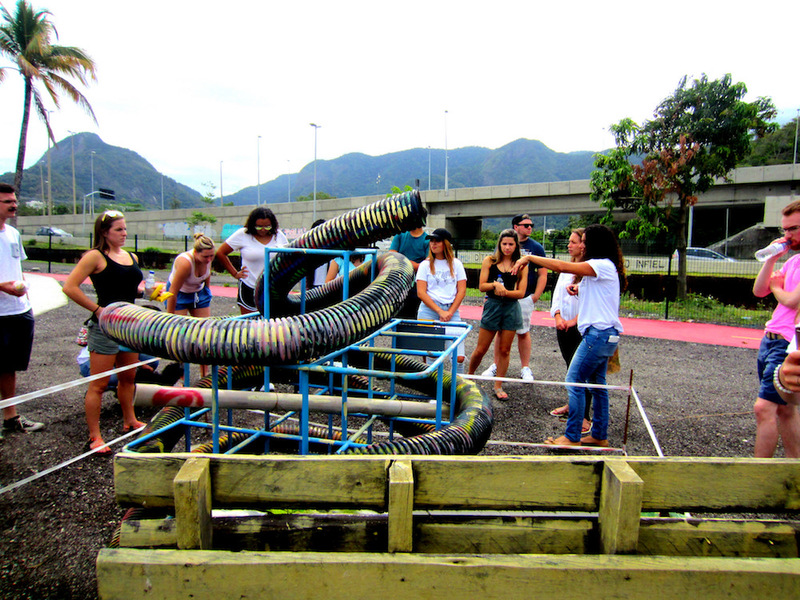 On October 4, 2017, Catalytic Communities led an Educational Community Visit for a group of 26 students from Augustana College in Illinois to Vila Autódromo in Rio’s West Zone. 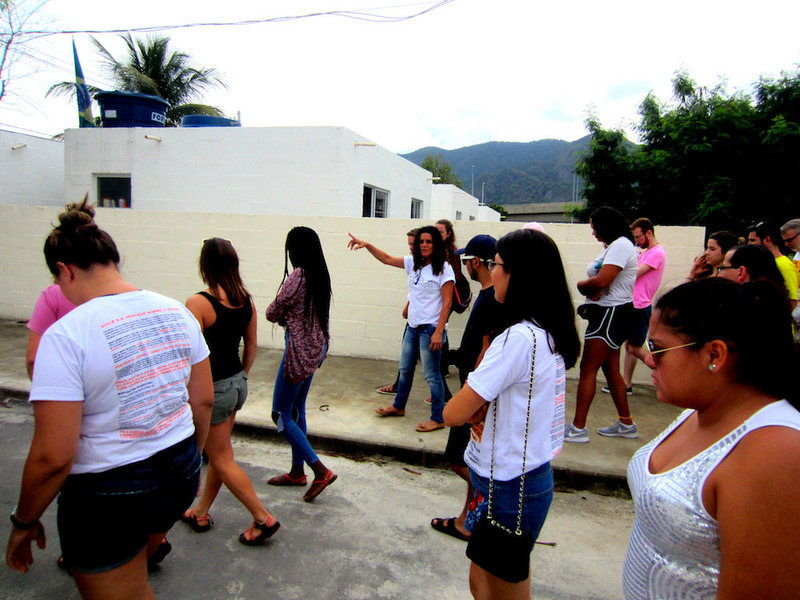 There, students met community leaders Sandra Maria, Maria da Penha, and Luiz Cláudio da Silva and heard the story of the favela’s struggle against forced eviction in the lead up to the 2016 Olympic Games. 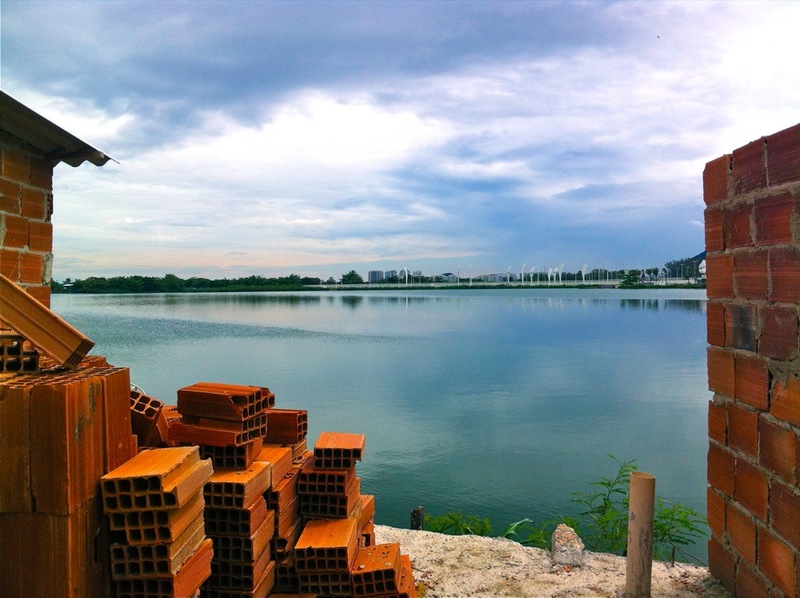 During this time, city officials and then-Mayor Eduardo Paes targeted Vila Autódromo for removal because of its location on the western border of the slated Olympic Park and in an area of Rio increasingly under pressure from real estate speculation. The Augustana group learned about the community’s history and resistance tactics while observing the physical impacts of the city’s evictions campaign, which reduced the community from some 700 to 20 families. 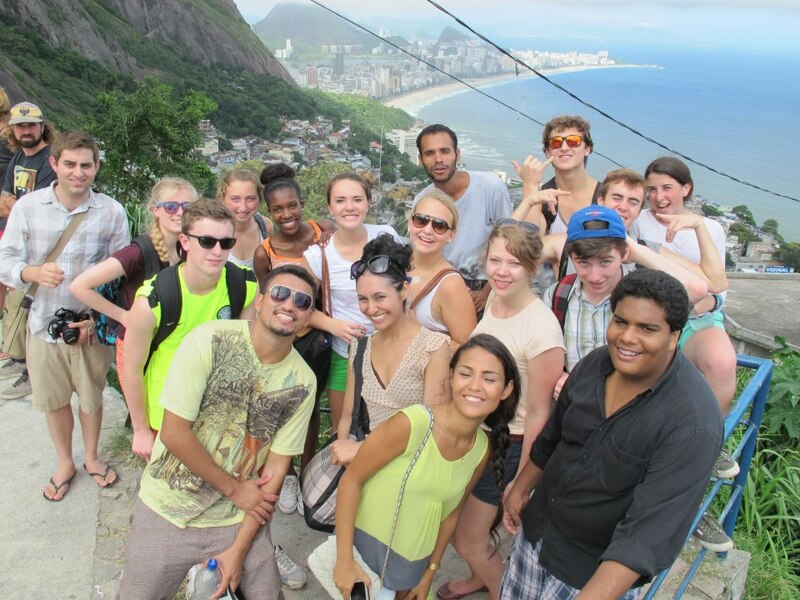 The students, accompanied by Political Science Professor Mariano Magalhães and Economics Professor Christopher Marmé, were in Rio as part of a five-week study-abroad term in Brazil focusing on the nation’s politics, economics, and culture. On the morning of the visit, they met CatComm staff members Cerianne Robertson, RioOnWatch Editor and Media Monitoring Coordinator, and Luisa Fenizola, Public Policy Analyst and Coordinator. 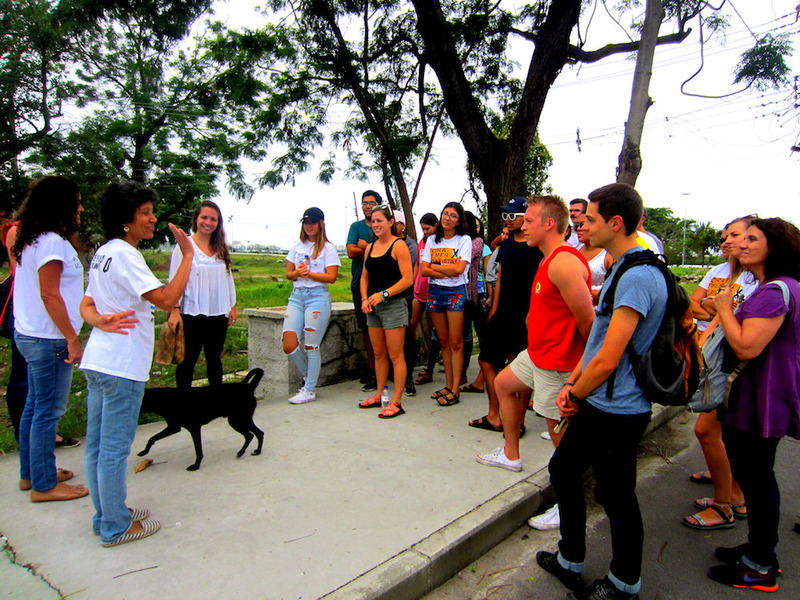 While on the way to Vila Autódromo, Robertson and Fenizola gave a brief overview of CatComm’s work and the history of Rio’s favelas. 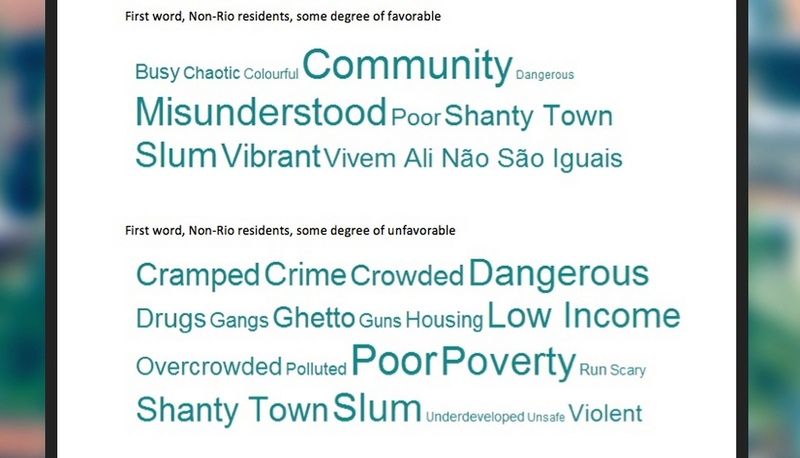 They explained CatComm’s role in amplifying the reach of Vila Autódromo’s resistance campaign through the RioOnWatch platform, a resource for a local and international audience of journalists, activists, researchers, and community members. Upon arrival, Sandra Maria and Maria da Penha welcomed the Augustana group into Vila Autódromo’s Catholic Church, a symbolic site of struggle that was spared from demolition. 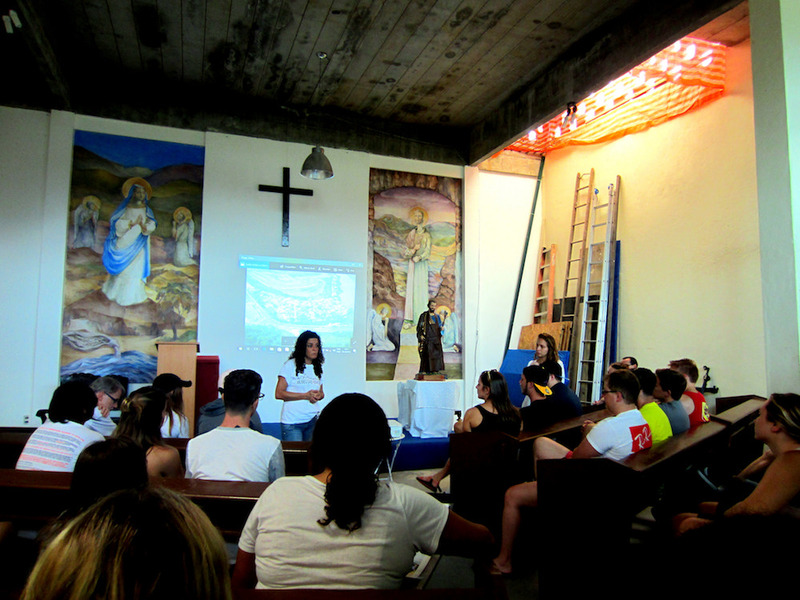 With Fenizola translating from Portuguese to English, Sandra Maria explained the favela’s history through photos, telling the students how the area had been populated by fishermen and construction workers on the racetrack formerly located on the Olympic Park’s land. She emphasized that local organizing was nothing new for the community. The exodus of wealthy cariocas from the South Zone to the neighboring Barra da Tijuca beginning in the 1980s resulted in the transformation of the area with the construction of exclusive condominiums and malls. 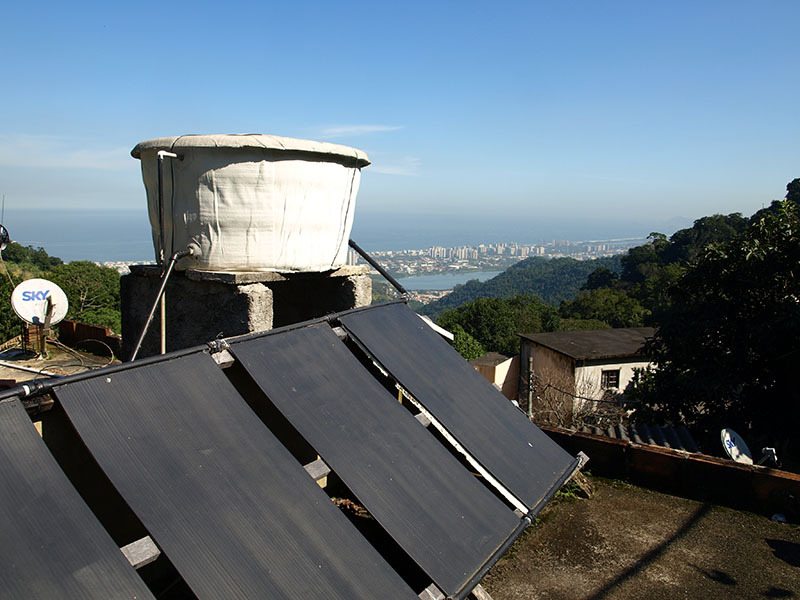 Abandoned by the city government, Vila Autódromo organized itself to install septic systems and register its streets in the city’s postal system. 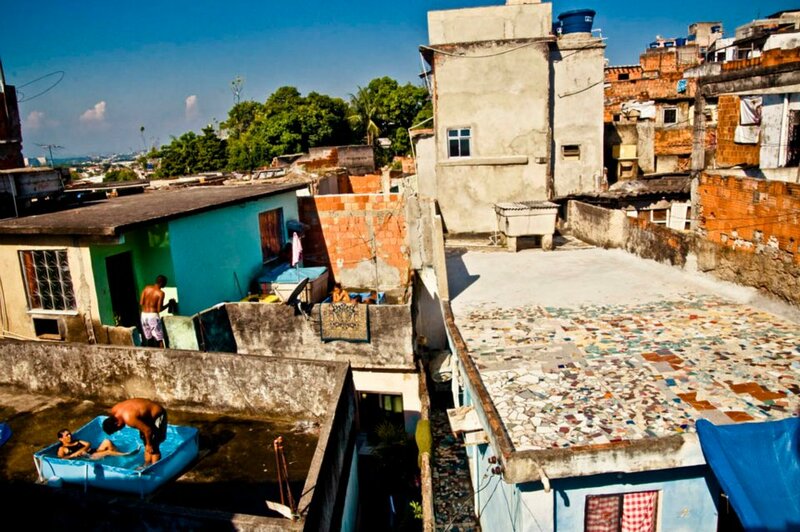 Maria then turned to Vila Autódromo’s well-documented struggle against forced eviction after the City announced in 2009 that its plan for the construction of the Olympic Park would require the favela’s land. Students asked how the city government could justify these evictions given the presence of the residents’ long established homes on the land. Maria replied by laying out the shifting set of justifications the city used, from needing the land for the new BRT (Bus Rapid Transport) station to a supposedly essential parking lot (although the designated parking lot space has remained abandoned). The students learned about the variety of tactics the government used over the three years it carried out evictions. Maria spoke of how officials relied on the divide-and-conquer strategy of isolating poorer residents and enticing them to leave with offers of housing elsewhere and cash settlements. She also explained that the City deployed shock troops on multiple occasions to intimidate residents and let bulldozers carry out irregular demolitions that cut water and power to the community as well as posed health risks to the remaining residents. 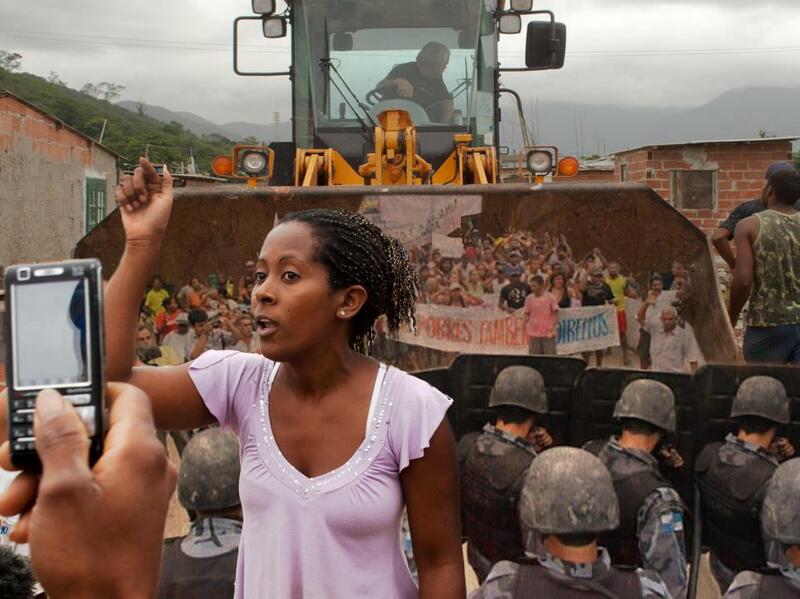 Maria da Penha was able to attest personally to police violence, showing the students an internationally publicized photo of her blood-covered face after she peacefully resisted the demolition of another resident’s home. 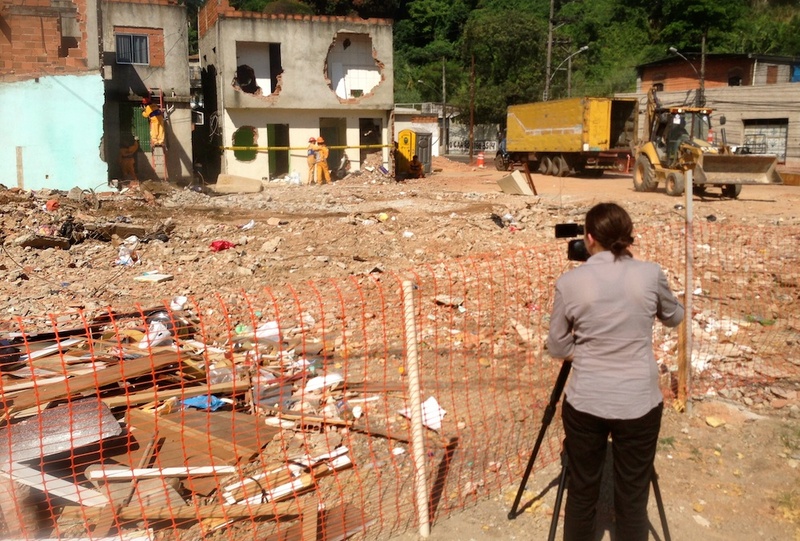 Sandra Maria said that Vila Autódromo activists have observed this “recipe for evictions” in cases across Rio and the globe. Augustana students asked how Vila Autódromo residents supported each other in these stressful and dangerous times. 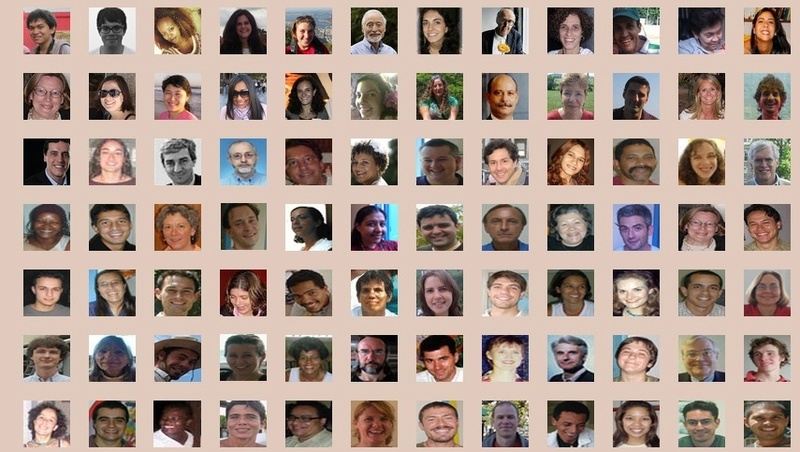 Sandra Maria described the community’s multi-faceted and successful resistance. 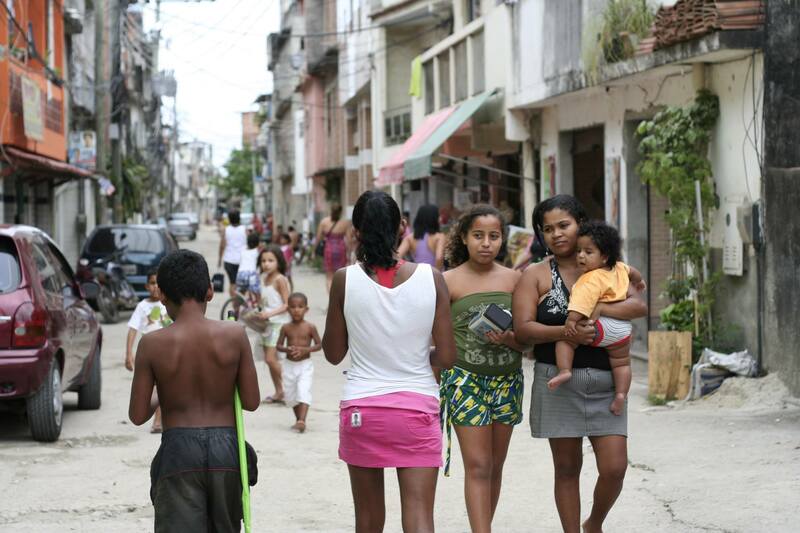 This included weekly community meetings to promote closeness and inform the residents of their rights; cultural events to emphasize the neighborhood’s amazing sense of community and to sustain engagement with a broad movement of supporters; protests; and wide-reaching online campaigns like the #UrbanizaJá (Upgrades Now) hashtag, which garnered substantial use on Facebook. 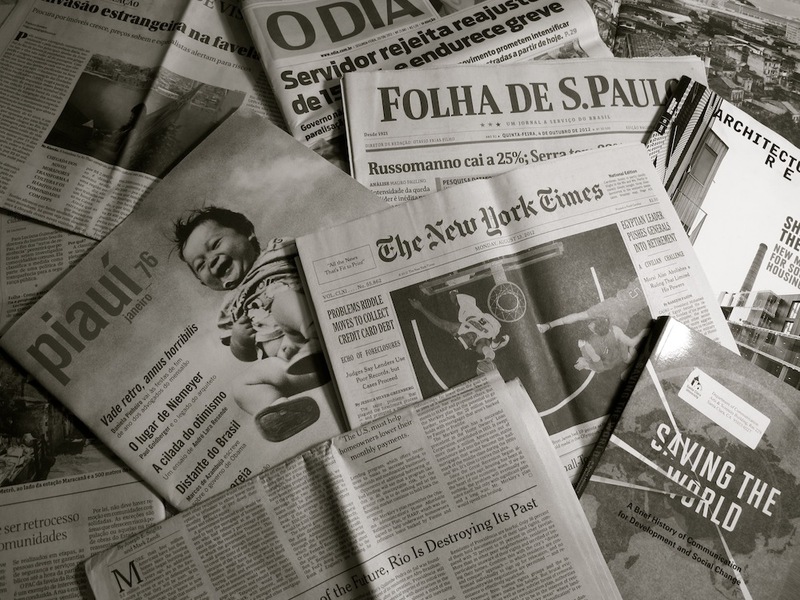 Luiz Cláudio da Silva explained his role as the de-facto community photographer, documenting every step of the evictions for a local and international audience. 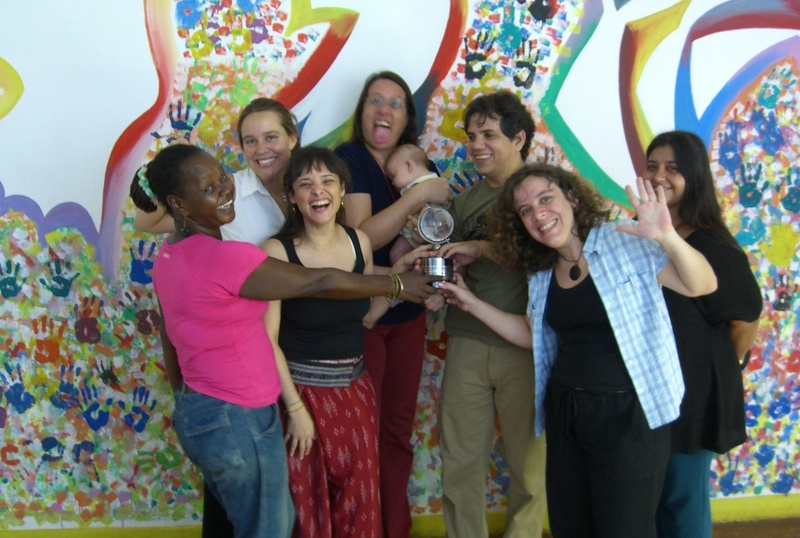 Maria da Penha told the students: “you are also tools of our struggle because you take our story outside of [Brazil],” highlighting the role of international solidarity in her community’s success. 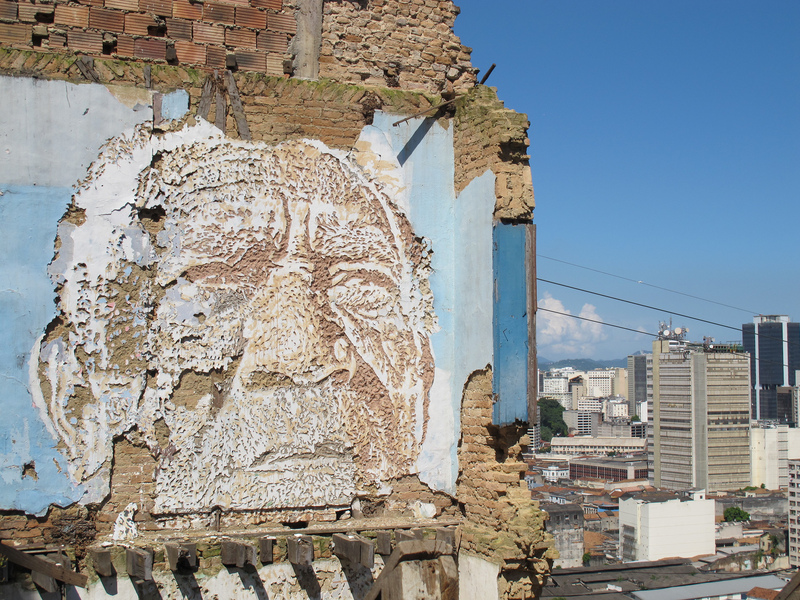 Da Penha explained how the community founded its own Evictions Museum to document its resistance and preserve Vila Autódromo’s history even as many families were pushed out. Leaving the church, the students saw some of its exhibitions, including sculptures made out of material salvaged from the rubble of demolished homes. 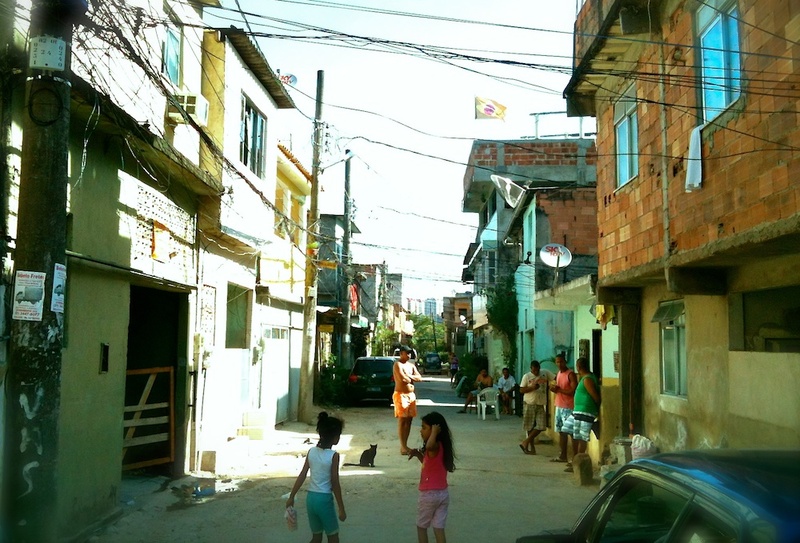 Walking around the community with Sandra Maria and Luiz Cláudio da Silva, the students were able to notice how different it looks from the tree-filled streets they saw in the pre-Olympic photos. They saw the last remaining home from the set of original Vila Autódromo buildings and the massive (and empty) parking lot of the Olympic Park complex directly adjacent to it. 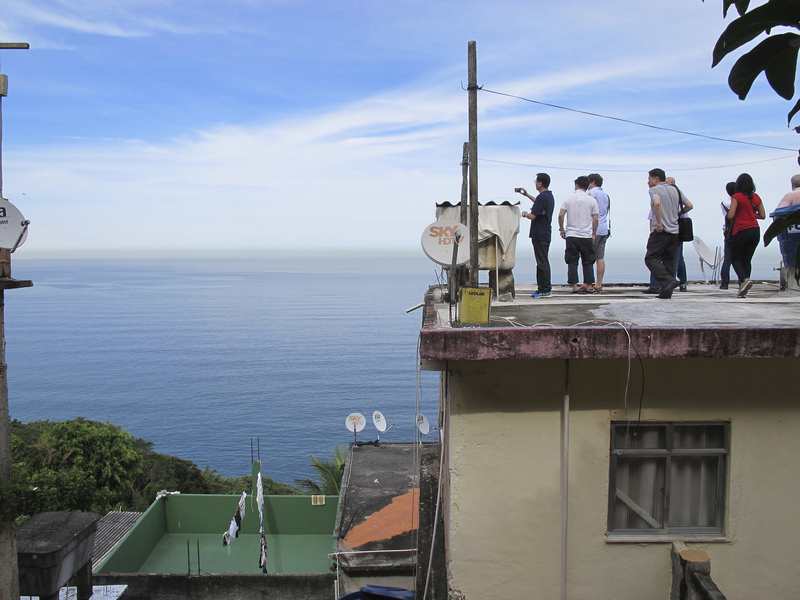 They also were able to tour one of the identical white homes built for the remaining 20 families that continued their resistance until winning a landmark deal to stay on their land, the first collectively signed favela housing agreement in Rio history. Sandra Maria said she hoped the students would “use our story as a tool” and take two lessons away from their visit. First, she said that Vila Autódromo was not an isolated incident but rather part of a global struggle against exploitation of those in precarious positions. Second, standing in front of the new homes, she told the students that only working with allies makes victory possible. 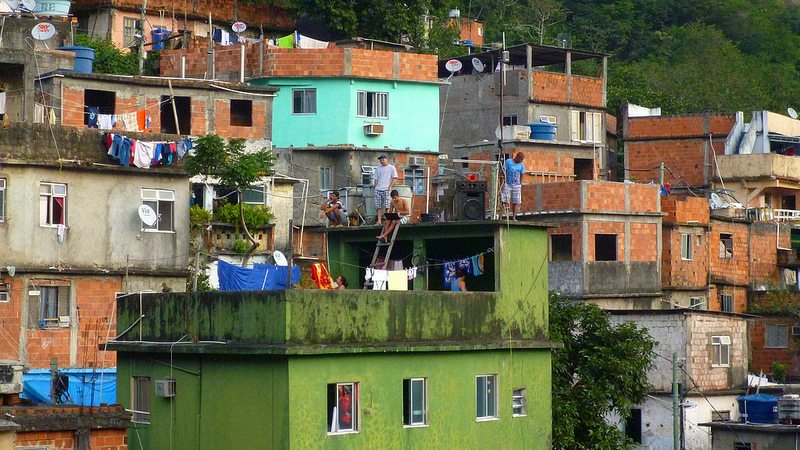 Vila Autódromo residents continue to work as activists in Rio, aiding other communities in similar struggles against real estate speculation, eviction, and gentrification. 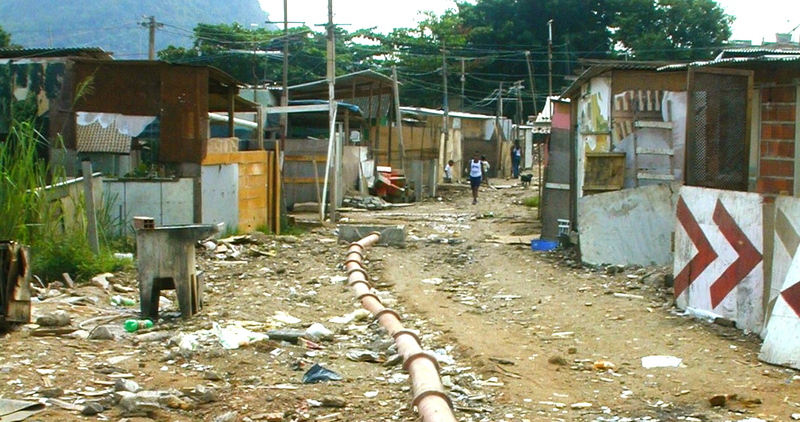 Sandra Maria commented that they had succeeded in demanding that the street running through their villa be renamed “Vila Autódromo Road,” to ensure the community would never disappear from official maps. 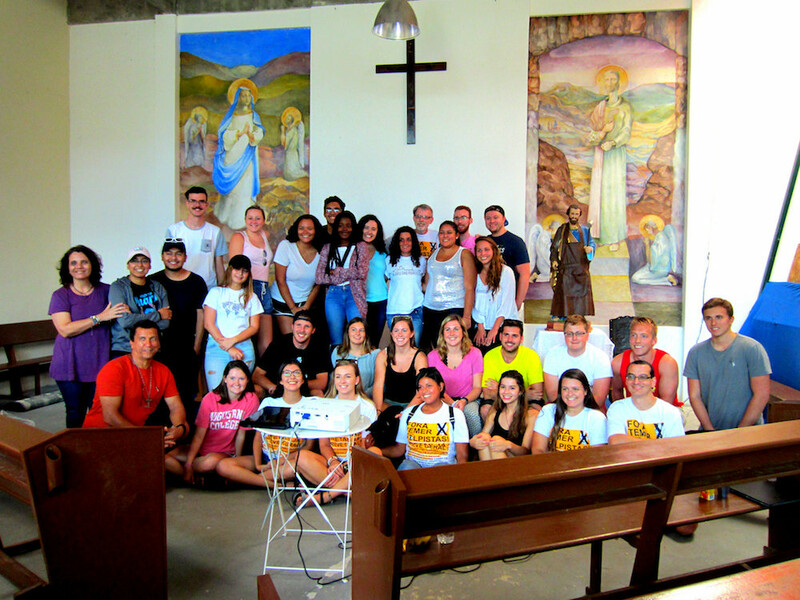 At the end of the day, the Augustana students thanked their guides and promised to spread Vila Autódromo’s story upon their return home. On their walk back to the bus, they passed the Olympic Park, already deteriorating and seldom used only one year after the Games. They continued to bubble over with questions through the ride back to their hotel, asking CatComm staff about the government agencies’ responsibility to respond to the region’s water pollution and whether any Olympic athletes spoke out about the negative social impacts of the Games, such as evictions. They were shocked to learn the International Olympic Committee forbids competing athletes from all forms of political commentary, although some athletes challenged this rule. 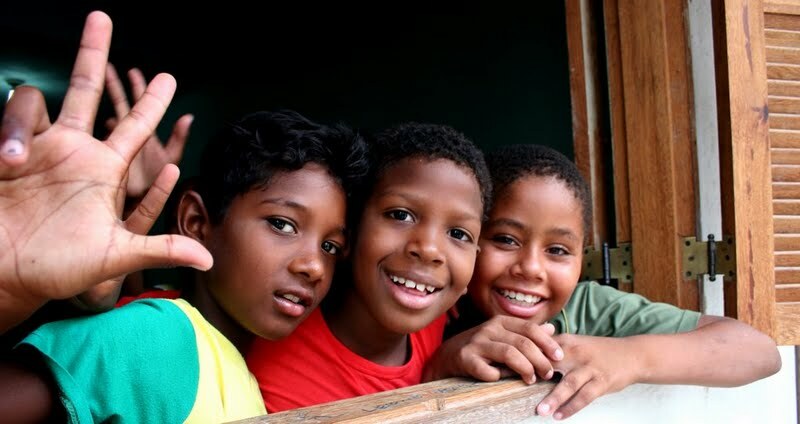 They left with a new appreciation of the impacts of this international mega-event on the lives of Rio’s favela residents, and questions about whether an Olympics could ever be hosted in a way that truly leaves a positive legacy for all the host-city’s citizens.